The coastal parish of Weybourne is situated in northeast Norfolk, to the west of Kelling. Its name may come from the Old English for ‘felon’s stream’, and it has been suggested, rather gruesomely, that the area may have been a place where criminals were drowned. The parish has a long history, and was certainly well established by the time of the Norman Conquest, its population, land ownership and productive resources being extensively detailed in the Domesday Book of 1086, which, among other things, records several mills in existence at the time. The earliest evidence of human activity comes in the form of a Palaeolithic chipped flint tool of unspecified type (NHER 6254), a mound of burnt flints (NHER 6253) and a flint handaxe NHER 12755), found in the cliff face in 1977. Mesolithic flint flakes and animal bones were recovered from an exposed layer of peat and clay on the beach in 1939 (NHER 6256). The layer was exposed again in the late 1980s, when further Mesolithic worked flints, animal bones, pot boilers and a hazelnut were found. Other Mesolithic objects recovered include flint flakes, an axehead and leaf arrowhead (NHER 6257), a core and scraper (NHER 12070) and microliths (NHER 33470). Neolithic finds include three polished flint axeheads (NHER 6259, 33103 and 40546). A chipped flint axehead (NHER 6260) could be either Neolithic or Bronze Age. The cropmarks of a probably Neolithic enclosure (NHER 22883) are visible in the south of the parish on aerial photographs. 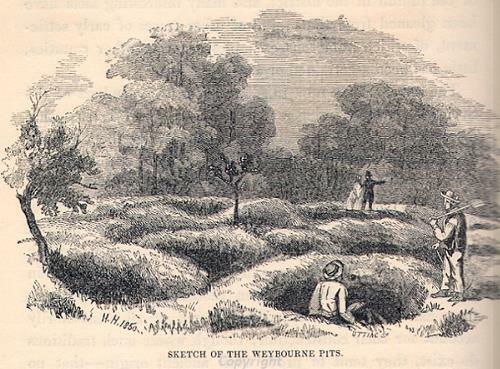 The site is thought to be a mortuary enclosure. Bronze Age objects include copper alloy axeheads (NHER 6262) and two awls (NHER 29168 and 30451). A Bronze Age round barrow (NHER 6261) in Hundred Acre Woods is visible on aerial photographs. The barrow is about 16m in diameter and is in good condition after trees and bushes were recently cleared away. It stands within Kelling Heath Holiday Park. Another possible barrow (NHER 40492) has been noted in Weybourne Wood, sitting on top of a small promontory with a fine view to the sea. The cropmarks of two ring ditches (NHER 32048 and 38341), possibly the ploughed out remains of round barrows, can be seen on aerial photographs. Late Bronze pottery fragments, cremated human bones and burnt flints were ploughed up in the north of the parish in 1963 (NHER 6263). A remarkable number of Iron Age objects, particularly coins, have been found. Two gold coin hoards (NHER 6264 and 6267) were discovered on the beach in the 1940s and 50s, and other gold coins (NHER 6265, 6266, 6268 and 6269) have been picked up over the years in the same area. A further hoard of 206 Iron Age coins (NHER 37080) was found at the back of the beach in the mid 1950s after a storm exposed two soil-filled features. Other Iron Age objects include a brooch (NHER 29098), pottery fragments (NHER 33260), a harness mount (NHER 29168) and a miniature copper alloy head (NHER 31088). The edge of a possible Iron Age settlement (NHER 34702) was noted to the east of Weybourne village during pipe-laying works in 1999. Roman finds include coins (for example NHER 6275, 6276, 15031, 17649 and 29097), pottery fragments (NHER 6277. 15030, 15604, 15605 and 30046), brooches (NHER 29097, 29168, 29806 and 29808), a buckle (NHER 29097), finger rings (NHER 29168 and 29423), pieces of brick and tile (NHER 33260) and a cult object (NHER 29097) featuring a peacock, a bird associated with the goddess Juno. Excavations to the east of Weybourne village in 1857 revealed the remains of a Roman pottery kiln (NHER 6273) about 1.2m below the surface. In the centre of the structure was a circular pedestal to support the kiln floor of firebars, on which the pottery was placed to be fired, the fire fed by a lateral furnace hole. About fifty Roman pottery vessels were recovered, three of them decorated with a foliated pattern beneath the rim, the others with fingernail ornamentation. The cropmarks of a possible Roman enclosure and field system (NHER 38342) northeast of the village are visible on aerial photographs. Saxon objects recovered to date include a pin (NHER 29168), a bridle piece (NHER 29098), a coin and a fine brooch (NHER 29423). A large dispersed group of earthwork pits (NHER 6280, 6281 and 6282) noted in the southwest of the parish have been interpreted as iron procurement pits dating from the Late Saxon to medieval period. Smelting may have also been carried out in the area, as quantities of iron slag have been found over the years. The Late Saxon period has left the remains of the earliest surviving structure, All Saints' Church and the ruins of Weybourne Priory of the Blessed Virgin and All Saints (NHER 6278). The present church grew out of a 13th century Priory of Augustinian Canons, which itself took over the site and building of a pre-Conquest church. The impressive ruins of the Saxon tower remain to the north of the present chancel and much of the outline of the Priory can still be seen. The canons added a south aisle for parish use and the old nave forms the present north aisle. 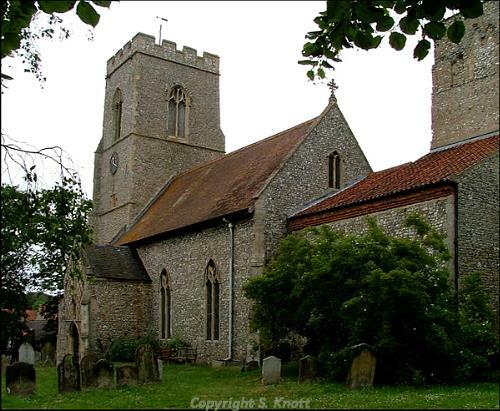 A handsome tower with nice sound holes and flushwork was added in the 15th century, as was the porch, which has good flint and brick chequerwork and had an upper chamber used as a chapel. The nave hammerbeam roof is of similar date. Inside is a Jacobean pulpit re-mounted on a plinth of 1888 and some early 16th century re-used poppyhead benches, one with a female head as an armrest, another with a bird. A medieval moated site (NHER 6304) with associated moated enclosures and fishpond is visible to the south of Rosedale Farm on 1946 and 1969 aerial photographs. The site consists of two moated enclosures on a platform on the hill slope overlooking Weybourne village. The larger of the two moats can be seen as an earthwork, to the northeast of which lie the remains of the second, smaller moat and channels connecting the two. The field in which the features are located is known as Hall Yards, and the modern Holt Road to the east used to be known as Hall Road, evidence that there was once a medieval manor house on the site. Quite a large number of medieval objects have been recovered, including a gold coin (NHER 23247), other coins (NHER 29097, 29098, 29168 and 30451), pottery fragments (NHER 25908 and 29423), buckles (NHER 29098, 29168 and 41118), brooches (NHER 29168), horse harness pendants (NHER 29168, 30250 and 31088), a pilgrim bottle (NHER 31088), a seal matrix (NHER 31088) and a silver finger ring (NHER 29097). Of the post medieval buildings to survive, probably the earliest is Spray Cottage (NHER 21885) on The Street, a small two storey flint and brick house with a date of 1606 outlined in brick on the façade, but much altered since. At Abbey Farm is a five stead flint barn (NHER 47631) of 1671 with a pantile roof. The west gable contains some re-used medieval stone, the barn having been built on the foundations of the monastic range of the former Augustinian Priory (NHER 6278). Abbey Farmhouse (NHER 47379) is a 17th century two storey coursed flint farmhouse, partly built over the ruins of the priory, with 19th century additions and other alterations. Old Farm Cottage (NHER 47506) on Station Road is a 17th century and later house of flint with brick dressings and a pantile roof. On Sheringham Road stands Weybourne Mill (NHER 15108), a mid 19th century five storey tower windmill, last used in 1916. It was converted to a house in about 1920 and restored in 1968/9 when the cap and sails were replaced. The attached granary was raised and converted to residential use in about 1920. It was originally two window bays wide but had a third bay added during the conversion. Another windmill (NHER 44629) at Millstream House is marked on 19th century maps, but no trace of it remains today. Old Watermill House and Mill (NHER 15109) east of Beach Lane is a probably 19th century water mill, the earliest mention of which is made in 1836. It was originally driven by a water wheel, which was replaced or re-hung, probably in 1855. This arrangement was updated by a turbine that was in use until the mill closed in 1929, and was still in place in 1984. The attached mill house has been converted to private use and it may be that the mill itself has by now gone the same way. On High Street is a type K6 square glazed cast iron telephone box with a domed roof, built to a 1935 design by Sir Giles Gilbert Scott (NHER 47885). On the Springhead Plantation is a spring-fed pool flowing under the adjacent railway. At the south end is a wooden pumping station housing an oil-driven pump. To the north is the site of a hydraulic ram, marked on a map of 1928, of which only the stone footings remain. The pumping station and ram (NHER 31323) served the Weybourne Court Hotel, which was demolished in 1939 to prevent it being used as a landmark for enemy bombers. In World War One there was a perception of possible enemy invasion along the Norfolk coast, and a series of concrete pillboxes and other defences were built. Most of these have long since gone, but a rare World War One circular pillbox (NHER 32502) survives, located within a hedgeline to the immediate north of one of the main southern tracks within Weybourne Camp (NHER 11335, see below). In 1940 during World War Two, the threat of attack was very real, and a massive programme of defensive construction was carried out, consisting of a coastal crust and various inland stop lines along rivers, canals and other natural obstacles. The heaviest anti-invasion defences were concentrated on the coastline, and Weybourne in particular was seen as vulnerable. The largest installation built in the area was Weybourne Camp, an Anti Aircraft Training Camp located alongside the cliffs to the northwest of the village. The camp originally started out as a temporary summer camp for the Anti Aircraft Division of the Territorial Army in 1935. At first it mainly consisted of wooden and tented structures, but in 1937 it was decided to make the camp permanent and more fixed structures and defences were erected. During World War Two the camp was surrounded by a perimeter anti tank ditch and defended by a system of gun emplacements and barbed wire. The interior of the camp consisted of groups of Nissen huts and barracks and other military buildings. The cliff top to the north was covered by a line of heavy anti aircraft guns and batteries, slit trenches and pillboxes. The camp closed in 1959 and has since been largely demolished. The remainder of the parish was crammed with other defensive structures and the huge scale of these can be seen on contemporary aerial photographs. There are far too many to mention for the purposes of this summary, and those wishing to research further should consult the detailed records. Although most of the defences were dismantled and cleared away after the war, some buildings do remain, including pillboxes (for example NHER 17819, 17820, 18108, 19440 and 24264) and anti-tank mortar bases (for example NHER 18109, 24266, 32515 and 32519). Fragmentary remains of beach defences, usually in the form of scaffolding poles (for example NHER 41572) can also be found. P. Aldridge (NLA), 11 October 2007.